Jodi Marshall: Today I was happy to find out that I would be working up at the flag staff this week. Last week I heard that they were beginning to find things like nails and glass. I too found similar things today. It seems peculiar that there is any kind of debris at this site where the flag staff is thought to have stood. Given all of the shards of glass and fire-cracked rock, I feel that we have some sort of dump site that was burned. I am pondering this however because I can’t understand yet why the military would have thrown any kind of rubbish on the parade grounds. 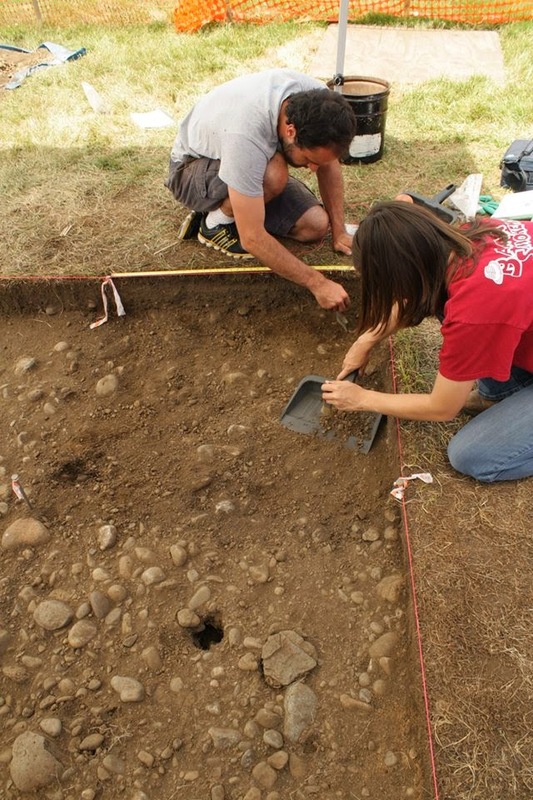 Students excavate at the Vancouver Barracks Parade Ground. The hole you see in this photo is a void that may be related to the site of the post's Flag Staff. Hopefully our excavations this summer will let us know for sure! The parade ground itself was quite busy today as the Fourth of July is almost upon us. The Army was there practicing for a change-of-command ceremony. A few soldiers came over to inquire what we were doing. We also had a group of young people come over to watch us. One of the girls asked how we found the area where we think the flag staff is located and Mikayla and I had a chance to explain to the group that we had used a magnetometer to help locate it. They were also excited to be able to watch Heidi screen a bucket of excavated sediment. This site is so interesting and I can’t wait to reach the next stratum.